This experiment demonstrates how to repeat the number of trials in a block a certain number of times while maintaining even distribution. The experiment contains a stimulus list that has 3 items in it, thus yielding 3 trials. But we want to present the same set of trials twice for a total of 6 items. It is important to note the setting While the condition expression is true. Another option worth noting is in the Block Editor's Randomize tab. 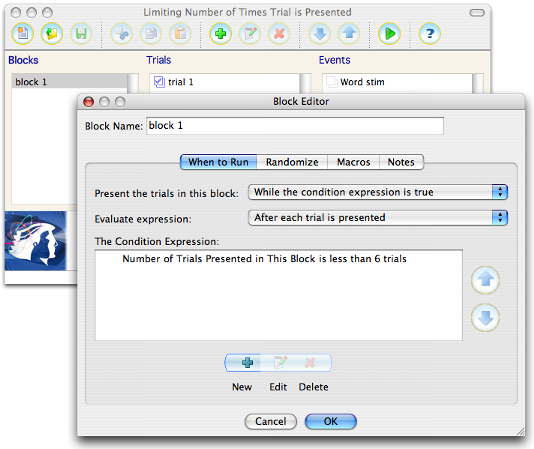 In addition to turning on the Randomize the trials in this block option, you need to also select the Every time the block is presented option, otherwise the trials will be presented in the same sequence over and over. If you add items to the stimulus list, you will need to edit the expression in the Block Editor so that it's an even multiple of the number of items in the list. Due to an earlier bug related to conditional branching, SuperLab version 4.0.6 or later is needed. All times are GMT -7. The time now is 06:42 PM.